Grass residences just as its name suggests, is a residence that embraces nature. A residence that lets its residents be surrounded with a sense of nature; beautifully grown trees, well kept grass and blue waters. 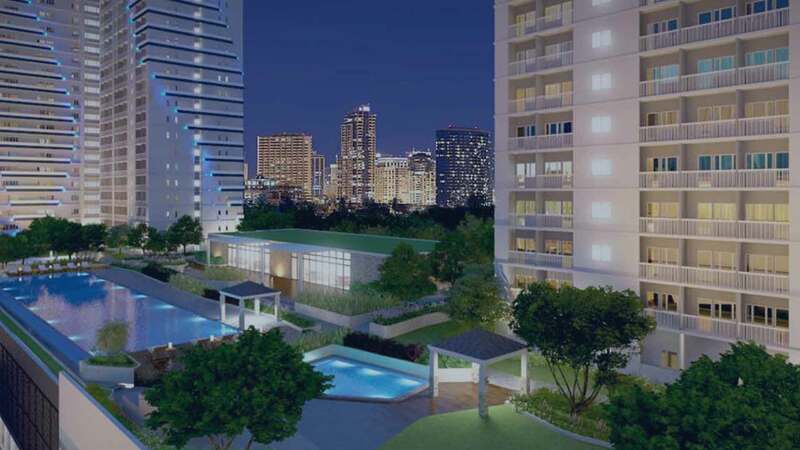 Grass residences is a refreshing oasis behind SM North Edsa. This residence brings the beauty of nature to a high-rise abode. There is more to homes than to provide shelter and that is exactly what Grass Residences is all about. Grass Residences is the perfect venue for an exhilarating and exciting break away from the day's pressure. A residence that soothes its inhabitants. Nothing feels better than the feeling of possessing a good home. A home that caters for all your needs. Grass residences is the best condominium to invest in a home. Towering amidst the cityscape, Grass Residences boasts of distinguishable design and architecture. The elegant residential suites boasts of tastefully decorated interiors and contemporary design. A home is a basic need for everyone and investing in a good home is the best thing one can do both for themselves and their family. That place that one goes to after sitting at the office desk the whole day or after a long day at school is what we know as home. This place is where we sit down, relax or close our doors and separate ourselves from the cruel world when things just don't seem to go our way. Well, Grass Residences are not just condos but are the best condos to live in. Everything is so comfortable here; sitting on that state-of-the-art chair, looking at that comforting colour on the wall, everything is just okay. The three tower residence is located at the heart of the everlasting attractive city of Quezon city no wonder there is much to gain and enjoy as a resident of the Grass residences.As an owner of a home at Grass Residences, one gets to enjoy refresh and frolic with the kids in the beautiful children's play area. Nothing feels better than having fun with the kids. In addition the residents have all the time and resources to cherish the with family and friends as they unwind in a verdant setting in the open green grass. In Grass Residences, every effort is made to make the residents feel comfortable. The units are much more stylish and luxurious than imagined. The condo is designed for utmost relaxation and convenience of the precious residents. Grass Residences gives a five star suburban living experience to its residents.This sanctuary by the name Grass Residences is everything to look for. With this residence, everyday living is anything but ordinary. The residents get to enjoy resort like amenities and first rate facilities that are only found in five star hotels. There is nothing more thrilling than the experience of living beside the best of the best amenities. Grass Residences gives its residents a privileged lifestyle with the comfort of its signature amenities. The first rate amenities allow the residents to have a deep dive into luxurious life and bond with family and friends in the most suitable environment. Speaking of style and sophistication, Grass Residences cannot be left out. Enjoying the active lifestyle of Quezon city is the residents' daily life. A residence that exposes them to the best that there is in the city; world renowned schools and the best hospitals in Quezon city.The residents of Quezon city have nothing to complain about unless they need to complain that everything in the residence is too good for them.Owning a home at Grass Residences is definitely the best experience ever in the residents' lives. Life is all fun and convenience for those living in Grass Residences. The residents are surrounded by first class amenities and impressive facilities in their daily life.The main clubhouse with the function rooms provide the perfect place for the residents to hold their events whether social or business. Life is always a bliss to these residents.The lounge and the main lobby are the perfect place for relaxing and catching up with friends after a long stressful day at work or school. In addition there are several swimming pools in the residences; adult swimming pools and kiddie swimming pools. Everyone is given a chance to enjoy the cool blue waters at Grass Residences. Keep fit by working out in the fitness gym. Grass Residence embraces healthy living no wonder it provides first class fitness facilities. Jog in the morning before going to work as a jog path is provided by Grass Residences to its residents. Grass Residences provides its residents with first class facilities in order to make them feel comfortable and luxurious. The residents have instant access to all good things offered in this stylish resident. Grass Residences offers the seamless fusion of the life and lifestyle that the residents have always been dreaming of. Get to your unit as fast as possible using the high speed elevators found in every tower of the residences.Apart from that, the residence has an exclusive bridgeway to SM North Esda. Life just has to be fun for these residents. The convenient, luxurious and stylish lifestyle that the residents live is to be yearned for. They get to enjoy a premium lifestyle all year round in a residence that offers them a five star suburban living. A residence with the finest amenities in town. Grass Residences elevates the quality of its residents' lifestyles. A residence that helps those who reside there to celebrate their lives' next phases in a five star lifestyle. Living at Grass Residences allows its residents to enjoy the vibrant lifestyle of the popular Quezon city. The city gives a vibrant social life to its residents. Quezon elevates the quality of its residents' life to new heights. As a resident of Quezon, one has an opportunity to celebrate all of life's milestone in an exciting manner. It gives the residents a chance to start life afresh in homes that inspires them. Quezon is a reflection of a superb dwelling. A lifestyle that is characterized by convenience and luxury. The city's exceptional features are inviting and makes its residents live a relaxed lifestyle. Quezon provides premium living to its residents in a superb way. They get to enjoy the convenience of living minutes away from the best in the city. Shopping malls and shopping centres are just minutes away from the residential areas. Furthermore, these shopping malls have first-class goods and residents can get all their basic needs from here. The bargain centres offer goods and services at a cheaper and at affordable prices. The residents of this fast-paced city have nothing to complain about when it comes to shopping. Lifestyle malls are spread all over the city to make their lives easier and much more pleasant. In addition, Quezon residences enjoy the best transport services in the country. The taxis are easily accessible and are the most comfortable means of transportation. Furthermore, they have their own parking areas which are not far from the central business district. As for the jeeps, they are the cheapest means of transportation and offer commuter services. Apart from that, the buses provide both commuter and intercity services. The train is always ready to provide intercity transport services. Notably, the best schools in the country are found in Quezon. This city lets the students live large and enjoy the exciting school life. Quezon touches the lives of its residents every single day of their lives. Parents do not have to worry about their kids attending schools that are far from home as schools are few minutes walk from the residential areas. First, Grass residence is close to key destinations in the town. Enjoy the convenience of living near key destinations in this progressive city by living at Grass Residences. The residence's strategic location in the town proper introduces a new perspective to residential living. The world renowned residence is developed with style, comfort and convenience in mind. It's location at the heart of the magnificent Quezon City makes it easy to access places of interest in the town. With Grass Residences, everything is within reach; schools, hospitals, terminals, shopping centres and government offices. Its proximity to the central business district makes everything to be within reach. One discovers a new way way of living with Grass Residences as it is minutes away from the Metro's commercial and entertainment centres. Its convenient location offers easy access to the city's must-see destination. Second, the residence is the perfect place for those who are looking for comfort, security and relaxation. This highly developed residence is a place where one can enjoy the magnificence of the legendary Quezon city. The residence spoils those who reside there with elegant retreats all year round at their doorstep. Its refined structures and features bring comfort within the residents' reach. Furthermore, there is 24 hour security plus CCTV cameras are placed on selected areas. Nothing can go wrong with Grass Residence. Stay safe and comfortable at this residence. Third, top notch amenities are found right within the development. This residence that is nestled in the heart of Quezon city provides first class amenities right at the residents' doorstep thus helping them to leave all their worries at the door. The top notch amenities allow the residents to live a five star lifestyle all year round. The resort-like amenities provide the residents with a relaxing and revitalizing lifestyle all round the clock. The amenities soothe the residents without ever complaining. Moreover, these amenities provide a vibrant social life to the residents thus helping to break monotony. Grass Residences takes it up a notch higher by providing the finest amenities in the country. These enables the residents to live a glorious lifestyle, a life that resembles that one that people experience during vacations. With Grass Residences, the residents live as if they are ever in vacation. The signature amenities are always ready to serve the residents by bringing joy and satisfaction to their faces. The finest amenities is indeed SMDC's trademark. In addition, in Grass Residences, there is an assured increase in property value of the residents. The residence's strategic location allows the residents to invest in things with great value in the city. Grass Residences is located in a prime location thus those who are interested in investing in business have a good opportunity to do so. Finally, Grass Residences is best for rental investment, vacation or retirement home. The units are spacious enough to accommodate both the growing and the young families. The residence acts as an ideal reprieve to all kinds of families. In addition, the first rate amenities and the impressive facilities of these residence makes it an ideal place to invest in a vacation home. This residence acts as a home away from home. It let's the residents enjoy exciting days and more memorable vacations at an affordable price. And as a retirement home, the residence provides everything to make one comfortable at their doorstep. There is nothing more exciting than living in Grass Residences. SMDC Grass Residences in Quezon City, Philippines is a premier Condo project available for sale. If you're looking to rent or purchase Grass Residences, then check here first. We have full details of Grass Residences updated regularly as well as everything you need to know about the availing and booking process, broken down into stages that includes selecting a unit, choosing a payment plan and buying your dream home at the right price. For price list, free site tripping or showroom visit, personalized service, model house, unit plans, floor plans, payment terms, CHAT LIVE with an agent 24x7. We are Remax Perfect Homes. Always only buy from PRC licensed Real Estate Brokers and Agents. Once you invest at SMDC Grass Residences, enjoy the privilege of having your unit open for renting out to balikbayans, expats, wanderlusts, tourists and other visitors to the city. Yes, if your intention is to have a very sustainable monthly income, the Grass is the right one for your precious investment. All you have to do is to have a reservation, pay the necessary down payment (DP) and choose the best option for you to pay the remaining balance (bank financing is one low-risk option). Please contact our expert real estate agents on this site for more details. Living at the Grass Residences will make your family’s life more convenient and comfortable. The site has for its immediate neighbors the Veterans Memorial Medical Center to the east, Metro North Medical Center and Hospital to the north, and Quezon City General Hospital and Dr. Montano G. Hospital to the west (all are at least less than 1km away from the project). The proximity from major medical institutions will be an absolute relief for family’s who are health conscious, reaching out for these institutions are an awesome reassurance. Aside from being located right at the back of SM North Edsa, there are still various choices for shopping, dining, entertainment and leisure located near the project. Muños Market, Philam’s Finest Cuisine, Trinoma, Tony’s Bar & Grill, Ninoy Aquino Parks and Wildlife Center, the Arboretum Forest, Quezon City Circle, Balara Filters Park, and other of Quezon City historical landmarks, sites and nature reserves are easily reachable from the site. Towers 1, 2, and 3 of the Grass Residences are all ready for occupancy (RFO) while Tower 4 is scheduled for a turnover date in December of 2019 while Tower 5’s turnover date is expected in December of 2020. These RFO units are gracefully built to cater to dynamic living and yet admirable for its total serenity and tranquility at the middle of one of the busiest destinations in Quezon City. Investing in a unit that is ready to be moved in is also very convenient as waiting time is reduced dramatically when you are badly in need of a shelter. Thrusting the safety of your family within the compounds of SMDC Grass Residences is one of the most important decisions you will make in investing in a long lasting sanctuary. The project has not only the most strategic locations, totally awesome amenities and facilities and has the most affordable price tag among other high-end brands, the site is also the safest of them all. The project is secured 24/7, has backup power generators (rendering it virtually blackout-proof), 4-6 high-speed elevators each building, fire alarm and sprinkler systems, CCTV surveillance systems, and so much more.